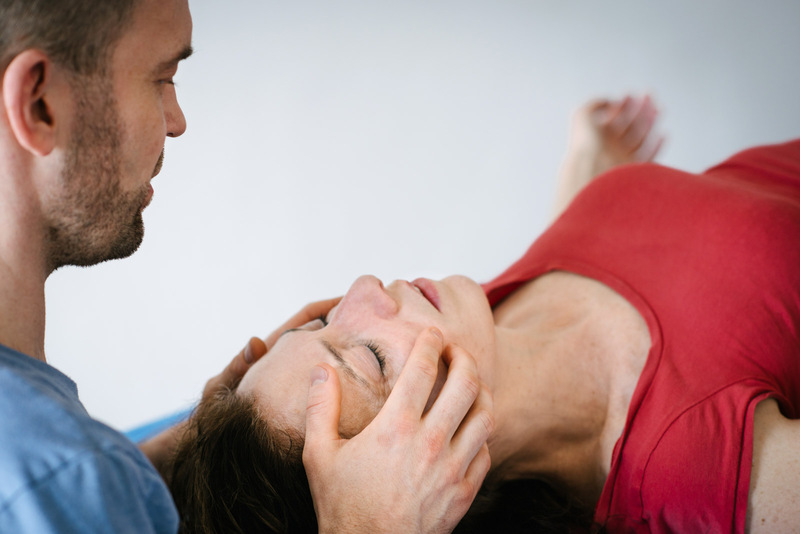 Bodywork with the Pantarei Approach consists of a series of meetings between practitioner and client, called sessions. A session takes about 60 minutes and includes different forms of touch combined with breathing and movement exercises. Tailored specifically according to the client’s individual aims and needs. The intensity and the intention of the applied touch varies hugely. It can be very light on the skin, it can activate or relax the deeper muscles layers or it can work with pressure on the bones. The touch is always applied with maximum attention and great care. In an initial talk we clarify the aim of the session and choose a form of touch or movement as a fitting entry point. Attentively, we observe and discuss the changes in the client’s thinking, feeling and physical sensations caused by the touch. In an intuitive way, the practitioner adjusts further touch, being in dialog with the client. Some sessions have a light and playful atmosphere. In some sessions, deeper emotions can rise up and then become more integrated. Sometimes the focus lies more on physical sensations like relaxation or relief from pain. In a Pantarei session guided by an empathetic practitioner in a protected environment, clients allow themselves to make space for their own contradicting thoughts, sensations and feelings. They learn to discover and trust what they really feel. And they explore the potential that lies within what they usually experience as limitation. In a trial session I can give you an estimation of the approximate amount and frequency of sessions needed to reach your goal. You don’t need to commit to any long-term obligation. My clients choose at any time freely, whether and when they want to book another session. Sometimes the practitioner’s touch can activate feelings that are stored within the body. Suddenly, there is joy, sadness, excitement or anger. The more clients allow themselves to acknowledge these emotions and give them space, the more they get in touch with their own basic life forces. Which in itself is always an empowering experience. Some sessions have a very light or playful atmosphere. In others, deeper emotions become integrated. Most sessions vacillate between very different, sometimes contradicting states, just as in ‘real life’. In order to allow ourselves to be touched, we need to trust in the situation. My intention as a practitioner is always to fully see and feel my clients. I strive to listen and understand them with full attention in order to touch them through my hands and my words. Through description and affirmation, physical sensations become amplified and integrated into consciousness. An ongoing dialog between practitioner and client is, therefore, necessary to create an atmosphere of understanding and expanding. Often in sessions physical flow in the body is activated. This can lead to intense somatic sensations. Like tingling or numb sensations in legs and arms, lightheadedness, sensations of warmth, heaviness or electric charge. After an initial surprise, clients usually start to enjoy these feelings and experience them as an intriguing expression of their own life energy.